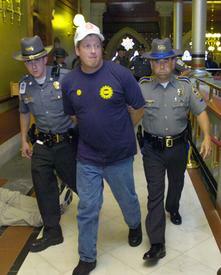 Twenty-two union leaders were arrested at the State Capitol in Hartford, Conn., June 1, as they called for universal health care. The arrests were made at different locations throughout the Capitol building amid a heavy police presence. The union leaders were sitting-in outside the offices of the governor, the speaker of the House and the president of the Senate when they were grabbed by the police. The sit-ins followed a rally by over a hundred activists outside the building who had demanded that the state institute universal health care coverage in the six days before the legislative session ended. Universal health care was the top issue before the Connecticut Legislature this year. Wal-Mart was among the first companies to start doing this, and others have since joined the pack. Another labor leader arrested was Robert Madore, director of the 67,000-member Region 9A of the United Automobile Workers union. Madore told the press who were present in the Capitol that he began sitting in at Republican Gov. Jodi M. Bell’s office after she failed to appear for a requested meeting with union leaders at 4 p.m. Leaders from many other unions, including the American Federation of Teachers, the International Association of Machinists, the American Federation of State, County and Municipal Employees, the Teamsters, the Service Employees International Union, the Working Families Party, and the Connecticut Citizens Action Group participated in the rally. The 22 who were arrested were charged with disorderly conduct, a misdemeanor, and later released. Michael Fallon, the Capitol police chief, said that six were arrested because they refused to end their sit-in at the governor’s office and that 16 were arrested because they were blocking various stairwells in the building. The heat had been on the Legislature to pass a bill that addresses the needs of more than 400,000 people in Connecticut who have no health coverage, and thousands more who are underinsured, because in 2006, despite the election of a Republican governor, Connecticut voters put in a veto-proof Democratic House and Senate. The insurance companies, whose national headquarters line major streets in Hartford, have lobbied the legislators, telling them that universal coverage will cost more than the state can afford. A state legislative study, however, showed that Connecticut would actually save over $1 million. Recent polls show that 84 percent of the people in the state support universal health care. On May 5, the Universal Health Care Foundation sponsored a rally outside the Capitol attended by over 5,000 people. Since then, thousands of letters, postcards and visits to legislators, along with vigils at the Capitol, have kept up the momentum. Although the Legislature fell short, later in the week, of passing universal health care reform, many see the growth of a broad-based movement for universal health care across the state as a big plus. In the early morning hours of June 6, before adjournment, the Senate and House passed a bill that would extend coverage to low-income and some middle-income working people by broadening eligibility and increasing reimbursements to providers. The governor said she will veto the bill. “It is good they’ve done this, but it’s a far cry from universal health care reform,” said Beverly Brakeman of Citizens for Economic Opportunity, one of the groups leading the fight for universal health care in the state. The rally that took place prior to the arrests of the union leaders was part of a week of action involving, in addition to trade unionists, retirees, clergy, business leaders and grassroots activists, all pressuring the Legislature to pass universal health care reform. Joelle Fishman contributed to this story.